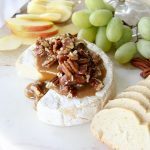 Make this simple and delicious Honey Nut Brie Appetizer for your next party! You can have it prepared and on the appetizer table in about 15 minutes! Chop the pecans, keeping the size coarse. Set aside. In a saucepan on low heat melt the butter. Stir in the honey and brown sugar, until smooth and the sugar is dissolved. Be careful not to cook the mixture or let it boil or the honey/sugar mix will become too hard. You just want the sugar to dissolve. You can serve this sauce over a room temperature Brie, if you prefer. Just pour the honey/nut mixture over the Brie cheese wheel and serve. If you like your Brie soft and a little warm, you can bake this dish as well. Just pour the honey/nut mixture over the Brie cheese wheel, then put it in a 350 degree oven for about 5-8 minutes, or until the Brie has softened, but not burst. Serve with slices of fresh baguette or crackers, and some apple slices and grapes.